Each year Perennial accepts applications from area high school students to attend the NREA Youth Energy Leadership Camp at State 4-H Camp in the Halsey National Forest, usually the third week in July. The popular 5 day camp is set up to give young people a better understanding of the legislative process, electric power generation and the rural electric program. Our goal is to offer a program that challenges participants educationally, recreationally and socially. The Youth Energy Leadership Camp is established as an operating rural electric system and provides a “hands-on” approach to member-owned businesses. The students will join high school students from Nebraska and Wyoming, along with adult counselors and junior counselors. 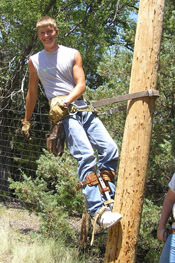 The adult counselors are employees of rural electric systems who donate their time and talents to the camp. 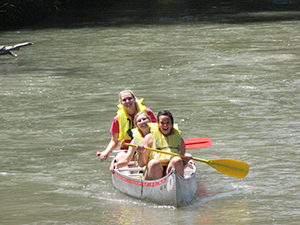 The junior counselors are selected by their peers to return to next year’s camp. The Nebraska Rural Electric Washington Youth Tour is an annual, week long, all-expenses-paid trip to Washington, DC, that is open to high school students who have participated in the Youth Energy Camp. Nationwide, rural electric providers from 41 states participate. In all, more than 1,300 young people from across the nation gather in Washington, DC, each year for this event. 4. Building students’ leadership skills so that they may make a difference in their rural communities. High school students who attend the energy camp have the opportunity to compete for a chance to participate as state ambassadors in the National Rural Electric Cooperative Association’s Youth Tour in Washington D.C. in June of the following year. All ambassador expenses are paid by the Nebraska Rural Electric Association and through a scholarship provided by Union Bank and Trust. Three students are selected by their peers to serve as ambassadors. The Ambassador competition involves submitting an application at Youth Energy Leadership Camp, presenting a self-introduction speech, and delivering a five-minute speech on an assigned topic. Each camper votes for three candidates following the speech with the top male, top female and person with the next highest vote total becoming next year’s ambassadors. The top six finalists and ties are invited to return to next year’s Youth Energy Leadership Camp as junior counselors. Anyone who has attended camp may also have the opportunity to attend Youth Tour as a delegate of Perennial. Those who are interested should contact Perennial for more information.